Attracted to the vast sound world for trumpet and organ, Ellie Lovegrove and Richard Moore decided to form a musical partnership as Illumina Duo in 2012. Their debut recording is a culmination of five years’ music-making in the rich aural landscape created by the fusion of the two instruments, which has included commissioning music from emerging British composers Paul Burke and Solfa Carlile. Ellie Lovegrove enjoys a freelance career in London, performing with a large variety of orchestras and small ensembles, for sessions, shows, and solo engagements. She has undertaken work with orchestras including the BBC Concert Orchestra, Academy of St Martin-in-the-Fields, BBC Scottish Symphony Orchestra and Britten Sinfonia, and on period instrument with the Orchestra of the Age of Enlightenment. As a chamber musician, she has performed for the London Handel Festival, and can be heard regularly with brass quintet Chaconne Brass in recitals and recordings. She also frequently performs for West End show ‘Les Miserables’, and with the Royal Shakespeare Company. In addition to Illumina Duo, solo engagements have included Shostakovich Concerto No. 1 at St John’s, Smith Square, and fanfares for Her Majesty Queen Elizabeth II. She has delivered masterclasses at Nanyang Academy of Fine Arts, Singapore, which also included contemporary music recitals. Ellie studied at the Royal College of Music, London, where she won the Brass Ensemble Prize and Brass Concerto Competition. Her professors included Paul Benniston and Michael Laird. 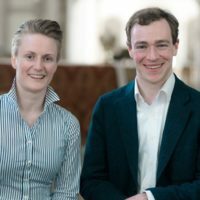 Richard Moore read Music at Oxford, before taking up a place at the Royal College of Music, studying repertoire with David Graham and improvisation with Sophie-Véronique Cauchefer-Choplin, graduating from the MMus degree with distinction, and attaining the Walford Davies prize in organ performance. Alongside these studies, he was the organ scholar of St Paul’s Cathedral, where he played at a number of important occasions, including the funeral of Baroness Thatcher. After leaving St Paul’s, he spent a year as Acting Assistant Organist of St Martin-in-the-Fields, a particular highlight of which was a service to commemorate the 70th anniversary of VJ Day, in the presence of HM Queen Elizabeth II and other members of the royal family, and broadcast on BBC television. Richard continues his studies with David Graham and Bine Katrine Bryndorf, and is Sub Organist of Guildford Cathedral.